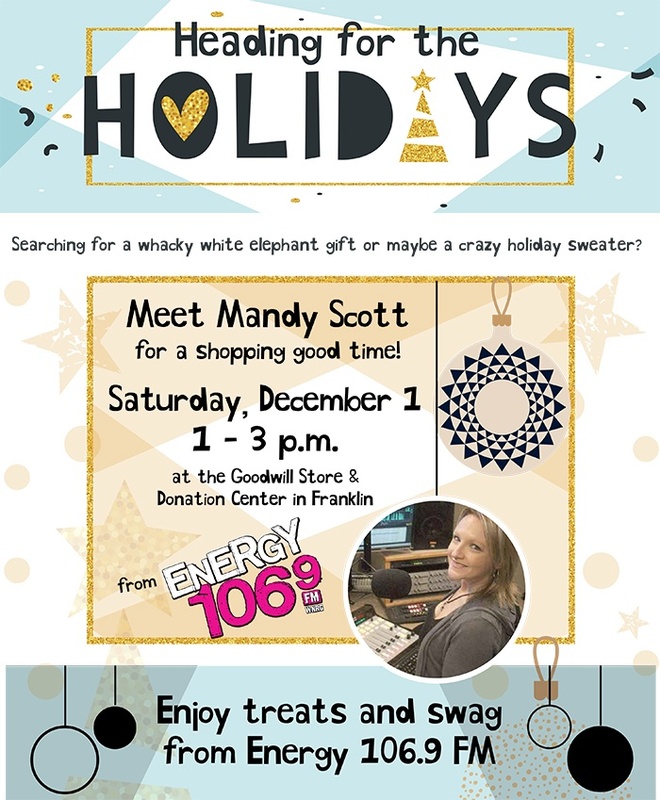 It's time to get rolling on your holiday shopping, so why not stop in the Goodwill Store & Donation Center in Franklin on Saturday, December 1 between 1 and 3 p.m. for a shopping good time with Mandy Scott! Enjoy treats and swag from Energy 106.9 FM and register for your chance to win $25 grocery store gift cards, $25 gas gift cards and $25 Goodwill gifts cards. Winners will be pulled every 12 minutes! 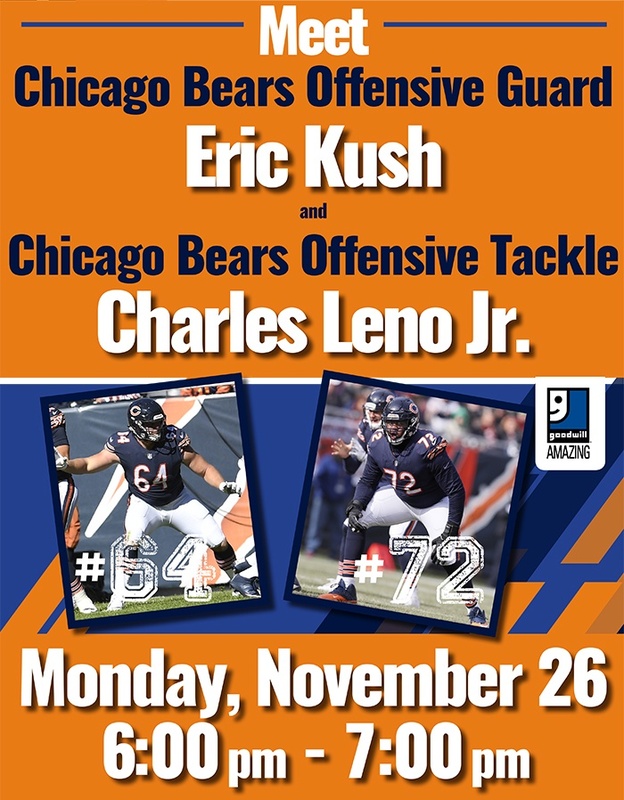 Stop by the Goodwill Store & Donation Center in Round Lake Beach on Monday, November 26 between 6:00-7:00 p.m. to do a little Christmas shopping and meet Chicago Bears Offensive Guard, #64 Eric Kush and Offensive Tackle, #72, Charles Leno Jr. The first 250 people who stop by and say hello will receive one (1) autographed NFL photo! Get those shopping carts ready and shop Goodwill on Black Friday! Our stores will be open from 9 a.m. to 9 p.m. on November 23rd and you'll save 23% on your TOTAL PURCHASE when you spend $23 or more! At Goodwill, we believe holidays are meant to be spent with family and friends. As a result, all of our Goodwill Store & Donation Centers will be closed on Thursday, November 22 so our associates can enjoy the holiday with loved ones.Thank you for understanding, and thank you for continuing to support Goodwill's mission! 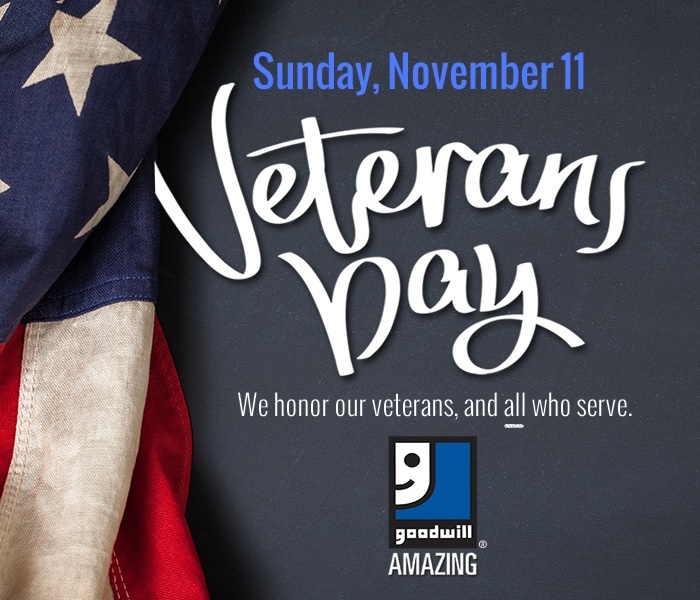 As we observe Veterans Day on Sunday, November 11, we honor all men and women who serve our country. At Goodwill we recognize that not all disabilities are visible on the outside. Post Traumatic Stress Disorder (PTSD) affects many soldiers attempting to adjust to civilian life, as it did with Dan Newberry, Manager of Goodwill’s E-cycle Operations in Milwaukee. As a U.S. Army veteran who served in the Iraq War, we're proud not only to have Dan as a member of our Goodwill family, but we're also honored to share his inspiring story with you. That's right, it's time to FALL BACK! Don't forget to turn your clocks back one hour on Sunday, November 4th! ... So, what will you do with an extra hour? You could always shop your local Goodwill Store & Donation Center! Or maybe now is a good time to clean out those closets and donate your gently-used clothing or other household items to Goodwill? One Day Only! 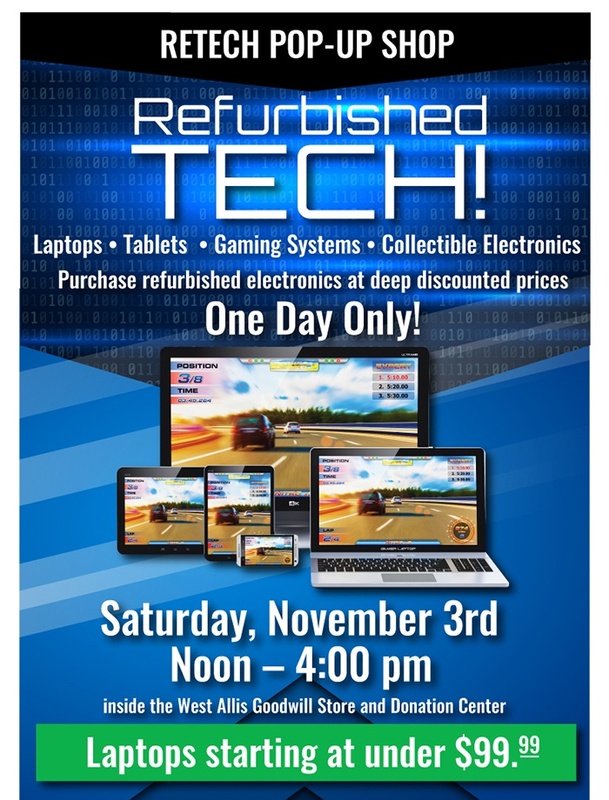 Stop by the Goodwill ReTech Pop-Up Shop located inside the Goodwill Store & Donation Center in West Allis this Saturday, November 3rd from noon until 4:00 p.m. Save big on refurbished electronics like laptops, tablets, gaming systems, collectible electronics, accessories and more. Laptops starting at under $99.99. Supplies will be limited so come in and shop early!